Lately, Jessie hasn’t been inviting me to many outings. I’m assuming this is because I’m probably the biggest party pooper EVER and I happen to be conveniently dating the biggest party lover EVER. If we aren’t completely black + white, I don’t know what is. Now, I know what you suspicious women are thinking: is he cheating on her? Oh my god, if he is, I swear I’m going to rip his head off internetly since I don’t know where he lives! But rest assured, he’s not. I mean, *technically* he could be. But I think the probability of that is about as much of a chance as pigs not only flying, but also wearing monocles and teaching law school. Really not going to happen. Honestly, he probably doesn’t invite me anywhere because truth is, I hate people. That’s just what it comes down to. The drinking, the smoking, the up-lateness… it conflicts against my staying-in-with-a-wine-cooler-and-being-on-Pinterest-in-my-yoga-pants-all-night plans. Oh, did I say “all night”? I meant until 9pm. Plus, when I do get out with him, I’m always pigeon-holed into one of two positions: Awkward Standing Girl or Angry Texting Girl. Awkward Standing Girl goes as follows. Enter party with Jessie. Jessie walks around saying hi and chatting with everyone. I stand by awkwardly and eventually, lose him to the throng of smokers outside where he typically resides during parties. This means I stand awkwardly in the corner, maybe bobbing my head lamely to the music if I’m feeling feisty, but usually just standing there, twiddling my thumbs and desperately praying that the friendly dog walking around comes back so I can pet it half to death since it’s the only thing I care to associate with. Angry Texting Girl is when I’m in a particularly bitchy mood (more than normal) and stand in the corner awkwardly, but this time, ferociously texting someone–ANYONE, people–or Instagramming, tweeting, web-surfing, shoot, sometimes even just tapping random apps on my home screen. Every so often I’ll occasionally look up to survey the yep, still lame party, and inevitably I’ll make eye contact with some drunk douche and I’ll give him this evil eye so he leaves me alone so I can go back to checking tomorrow’s weather for 981st time. So basically, I’m not invited anywhere. I’m not exactly shedding tears. After all, had I been Angry Texting Girl or Awkward Standing Girl, I wouldn’t have made these blondies. Blondies are always cooler than people. Fact. 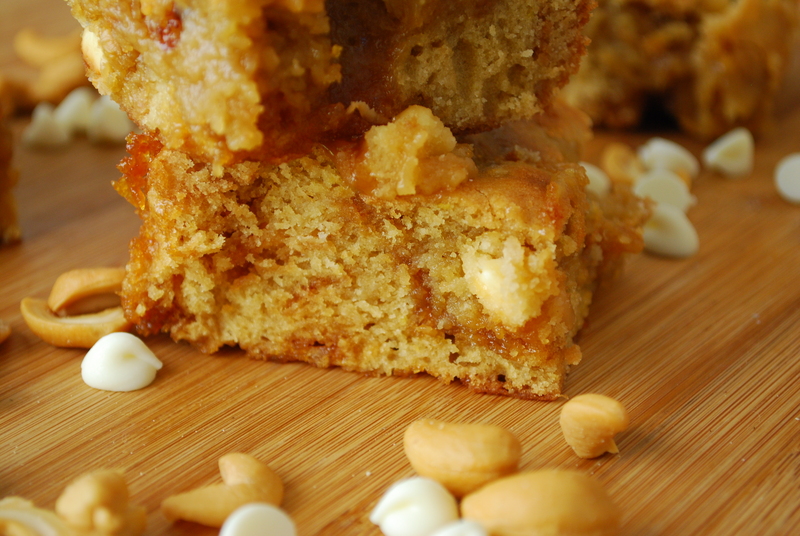 Specifically, White Chocolate Caramel Cashew Cookie Blondies. 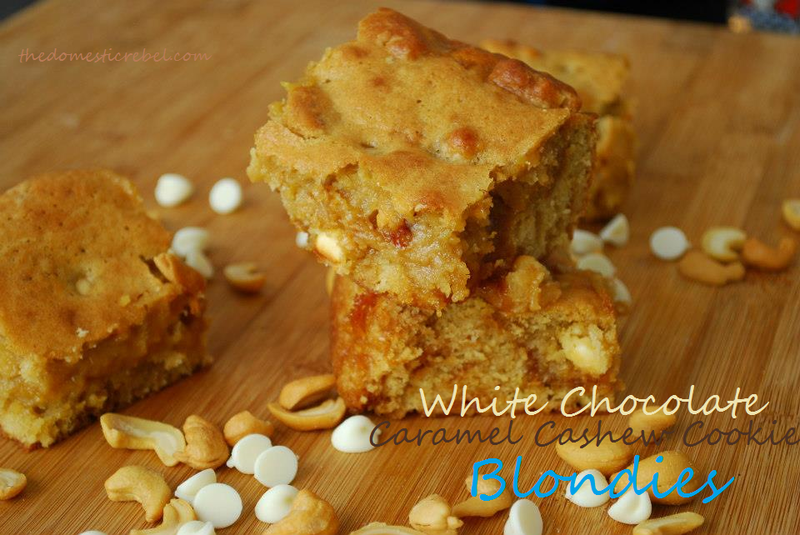 A name, yes, but one that introduces you to some of the bestest blondies evah. 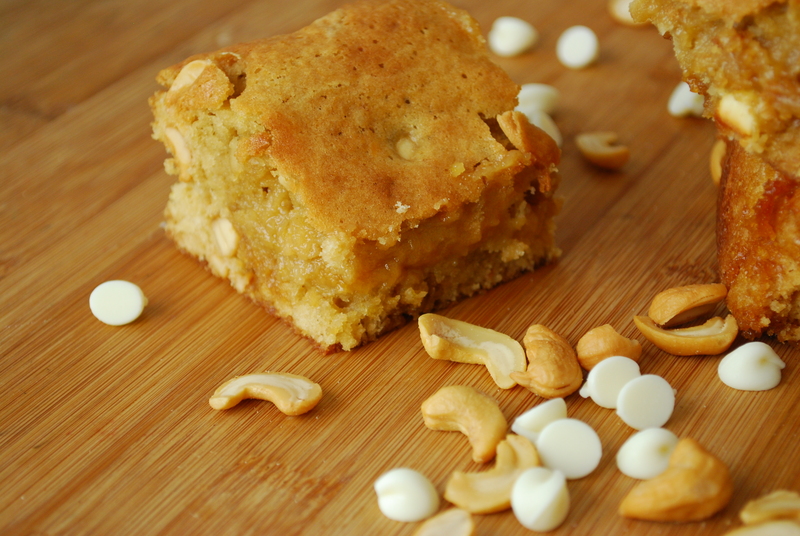 The line-up: a tried-and-true (killer) basic blondie base stuffed with chopped white chocolate macadamia nut cookies (Pepperidge Farm’s Tahoe are my favorite), a middle layer of oozing caramel, and roasted cashews. Sounds like a lot, but really, it works. It works damn good. The cookies get soft and provide an added sweetness, and the mixture of macadamia nuts and cashews gives these nice texture, saltiness and a good crunch. And a caramel swirl for good measure. All in all, some of my fave blondies. Seriously. It’s worth staying in for, trust me. 1. In a medium saucepan, melt the butter and brown sugar over medium heat, stirring frequently. Once melted, remove from heat to cool for about 5-10 mins. 2. One at a time, mix in the eggs and vanilla extract. Lastly, stir in the flour, baking powder, soda, and salt to combine. Stir the chopped cookies and roasted cashews into the batter. 3. Preheat oven to 350 degrees F. Line an 8×8 inch baking pan with foil, extending the sides over the edges of the pan. Lightly mist with cooking spray. 4. Pour half the batter into the prepared pan, smoothing to even out. Drizzle the caramel evenly over the batter. Top with remaining batter, smoothing out evenly to cover caramel as much as possible (it’s okay if some of the caramel peeks through). Bake for approx. 25-30 minutes or until a toothpick inserted near the center comes out mostly clean. You want these a bit underdone. 5. Cool completely in the pan before cutting into squares. Store airtight, at room temperature, up to 2 days. 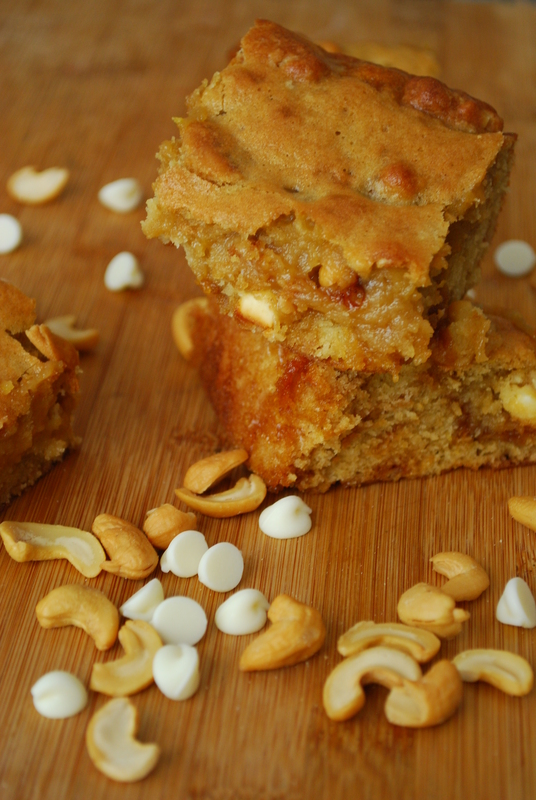 Ooey, gooey blondies stuffed with some awesome flavors, textures and add-ins. Does it get any better?? (The answer is yes, but only when you’re eating them at home, avoiding people, and Pinning like mad). I love blondies and the Pepperidge Farm Tahoe cookies sound great in them – along w/ the white choc! Love the descriptions of yourself at parties! Too funny! I always hated parties. Back then, I didn’t have a cell phone to occupy myself with so I would just stand in the corner, maybe another friend would be with me. We’d both be clutching cups of whatever just to be holding something. It’s way cooler to be home baking rockin blondies like these!!! Oh and just for the record, I’m right there with you on the yoga pants and Sangria for me! Oh jeez, if I didn’t have my cell with me I’d probably be screaming my head off and crying. It’s literally a life-saver, even if I’m seriously just pressing the weather app over… and over… and OVER again. Thanks Tanya! Same! Everyone Jessie’s age and my age (even though we’re getting older now people, ahem!) thinks it’s like SO TOTALLY AWESOME DUDE to party every weekend and get super drunk, and I’m like, can’t we just stay home? Order in pizza? Drink wine coolers? Also, their parties never have food which also makes it the worst party ever. Agreed! Can we please have a wild and crazy indoor Saturday night with movies and these blondies??! As long as he’s half naked and you have a pause button! Done deal. Crazy, Stupid, Love it is! cookies in blondies. your creativity will never cease to amaze me Hayley! I love those Tahoe cookies! And this blondie base looks so dense. Yum!! Anything that says cookie-blondie sounds good to me! Holy Cow Batman! These sound off the charts delicious! Yeah, I’ve NEVER been a party girl. I can’t tell you how many college parties I suffered through (literally), and I’m so glad that part of my life is past! =) Fortunately, my hubby doesn’t much care for the social scene, either. We’re a couple of wild ones–usually you can find us on Saturday nights watching sports or a movie, and I’m totally okay with that! And yeah, I’d be REALLY okay if I had some of these blondies!!! It would totally be worth staying in to polish off a pan of these! Love these, Hayley! In a totally non-stalkerish hetero way, of course. Hey girl, thanks so much! I’m glad you stopped by, even if you are in a little trouble, haha. Nice to meet you! xo.